X-Small/Small - $24.99 Small/Medium - $29.99 Medium/Large - $24.99 Large/X-Large - $29.99 Only 5 left! Bad guys aren't just going to punish themselves! The world needs a woman who's up to the task battling against all the villains of the world. The world needs you! This Women's Fly High Costume gives you a look inspired by comic book superheroes, so you'll have a look that's powerful enough to slay evil in its tracks. With a form-fitting style and a bold color scheme, the costume brings a level of confidence that may even have you ready to assemble your own team of super-powered friends for a night of crime fighting that world has never seen before! Just don't forget to bring your mace along with you, because you never know when you'll need to give evil a walloping it won't soon forget! The mask I was sent was crushed and broken - completely unusable. 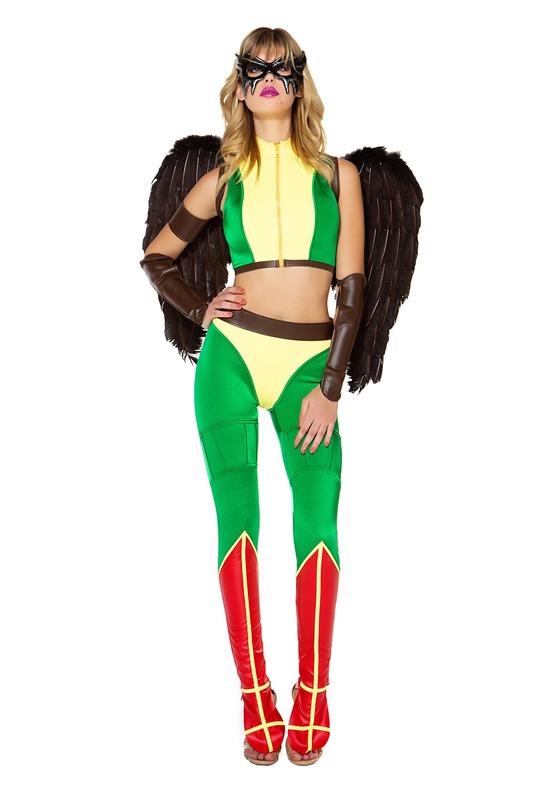 The costume is beautiful, and pretty good quality, but the leggings must be designed for a girl who is 6'4". It was bunched up like crazy at the bottom of my feet, even with heels (I'm 5'4" purchased M/L). Also, the yellow fabric on the back is COMPLETELY see through once you get it on.